Food is the basic need of every living being but many of our brothers and sisters in our society are deprived of the same. Let's join hands to support them and fulfill this basic need of their lives. I thank Sujit Lalwani sir for assigning 36meals.com as the theme of take away project for i3 delegates. Food is a basic need. By providing food we are able to spread smiles amongst people. So, 36meals project is my favourite project. On the first day, I went to donate a meal in the outskirts of Bannerghatta. I saw people with no shelter, no clothes and no food which was really a very bad phase of their lives. I felt that we are so lucky when compared to these people. Actually, my intention was to provide a meal for needy people. So, I went on searching for such kind of people. I walked 6kms and reached a hilly area. People there lacked basic facilities but were very curious to know as to why I had come there. People living in that area are courageous. They were leading their lives without security or proper shelter facilities. Their houses were made of coconut remains. I told about my project. When I opened a meal from a bag, the people rushed towards me as if they saw a silver lining in their day. Unfortunately, the meal I took was not sufficient to feed all the people assembled there. Next day, I met a family lacking basic facilities. They shared their feelings with me and I took initiative and offered to help their family in getting a ration card. 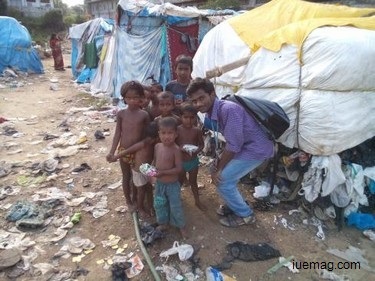 I could see the light on their faces and a broad smile when I promised to help them. I hope they get better privileges hereafter through ration card so that they can fulfill basic needs for their life. Many people are not aware of the facilities provided by the Government. So, I request everyone to bring awareness among those underprivileged people. 36Meals project is not limited to one week. It must be continued throughout our lives. Only then we can hope for a better India. Thanks to Sujit Lalwani sir for giving us an opportunity to execute 36 meals project! Any facts, figures or references stated here are made by the author & don't reflect the endorsement of iU at all times unless otherwise drafted by official staff at iU. This article was first published here on 2nd June 2015. Basavaraj TM is a contributing writer at Inspiration Unlimited eMagazine.